A late Regency Cornish glazed kitchen dresser in architectural style circa 1840 in two parts with original painted duck egg blue interior and old but not original paint to the exterior. 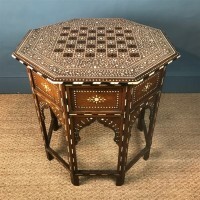 A Hoshiarpur bone inlaid chess table circa 1880 Northern India of the largest size in exceptional condition with barber pole border throughout . 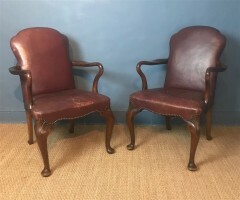 A pair of walnut and leather desk chairs circa 1920 by Maples of London in the George 11 style in excellent solid original condition with the original claret covered close nailed brass studded leather. 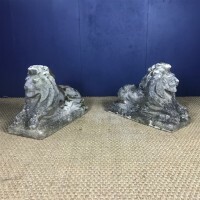 Perfect for either side of a partners desk . 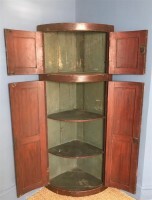 A Georgian painted pine corner cupboard circa 1820 in lovely original condition with simulated wood exterior and duck egg blue interior. 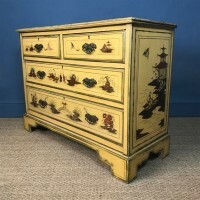 An Edwardian chinoiserie painted Chest of drawers circa 1910 with Chinese figures and landscapes painted on a yellow ground with two short and two long drawers on bracket feet . 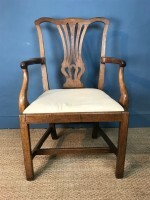 A Regency painted faux bamboo side chair circa 1830 in completely original condition with rush seat. 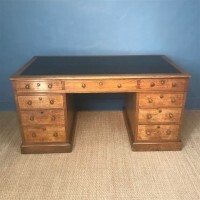 A Victorian oak pedestal desk by Maples of London circa 1890 of the best quality with mahogany lined drawers Bramah Patent locks stamped J T Needs 6 Down St Piccadilly. The business side with nine graduated drawers the reverse with dummy drawers and cupboards. The top with relined blind tooled black leather. 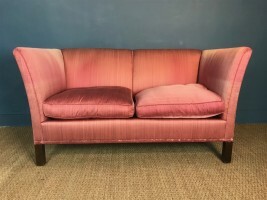 A small Edwardian Country House Sofa circa 1910 in excellent condition with soft down and feather cushions covered at present in a pink silk on mahogany legs . 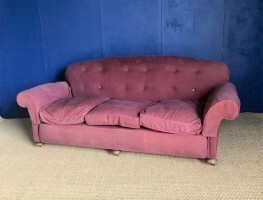 A large Edwardian Country House Sofa circa 1910 with three seat cushions on 3 bun feet . 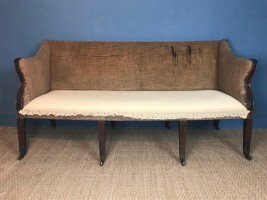 A George 111 mahogany campaign Sofa circa 1790 in great original condition with 8 square tapering legs and brass cappings and castors. 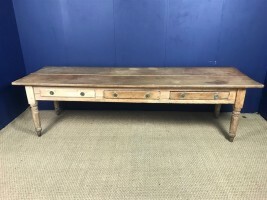 A George 111 mahogany two tier table circa 1790 in the Sheraton style with serpentine shaped top and a single drawer to the lower frieze on shaped tapering legs. 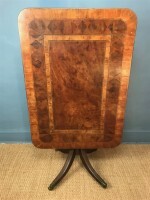 A Regency inlaid drop flap table circa 1830 the top inset with a parquetry design of mahogany and exotic woods on turned column and quadrapartite base. 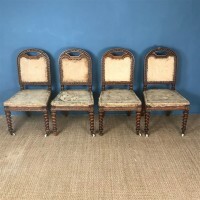 A large early George 111 walnut armchair circa 1770 in Chippendale style with drop in seat in excellent solid condition. A late Regency painted tall Chest of Drawers circa 1830 . 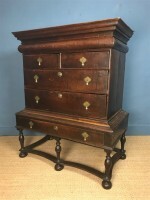 Read more: A late Regency painted tall Chest of Drawers circa 1830 . A large pair of Edwardian leather club chairs circa 1910 in lovely original burgundy leather also retaining the original velvet seat covers now re-utilised on new feather cushions. 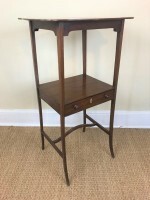 19 inches wide 19 inches deep 37.5 inches high. 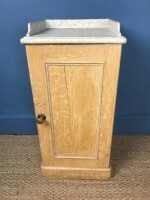 A mid 19th century painted pot cupboard circa 1870 in lovely original condition with faux white marble top. 15 ins wide 14 ins deep 31 ins high. 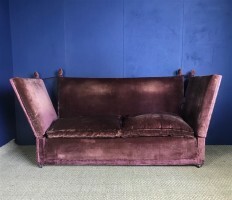 A Knole Sofa circa 1920 covered in the original wine coloured velvet . 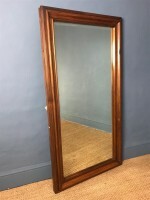 In excellent useable condition with soft down and feather back and cushions . The base and seat rewebbed. 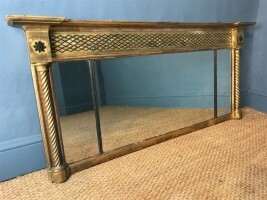 A George IV gilt overmantel Mirror circa 1820 with original water gilding and ebonised trellis frieze.